Decorative bronze vent covers are finished in a patina which give off a naturally warm color. These wall registers also have a solid core that is made from bronze, making it rust proof unlike steel vents. 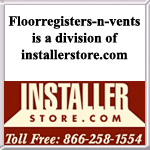 The bronze vent covers come in 21 sizes to fit your needs. Our wall registers install with mounting screws, which are provided with the purchase. These Hamilton Sinkler bronze vent covers are designed in the Heritage pattern which features sleek vertical lines. Each wall register is equipped with a metal, adjustable damper which will control both hot and cold airflow. Tip: To correctly order the wall register, measure the opening in the wall and not an old register cover. The 4 x 14 bronze vent covers will fit into a hole opening of that size. All wall register faceplates will measure 1 1/2 inches larger approximately, please call for exact dimensions. Important: These registers take approximately 10 to 12 weeks from when you place your order to drop ship directly from the manufacturer. Select bronze vent covers for the floor in the Heritage design to create a seamless look among your air registers. For other decorative wall registers, we have many styles and finishes available for selection. Order these bronze vent covers today and make a statement in your home at a price you can afford.